I’m writing this post to tell you about a rather peculiar day I had last month. 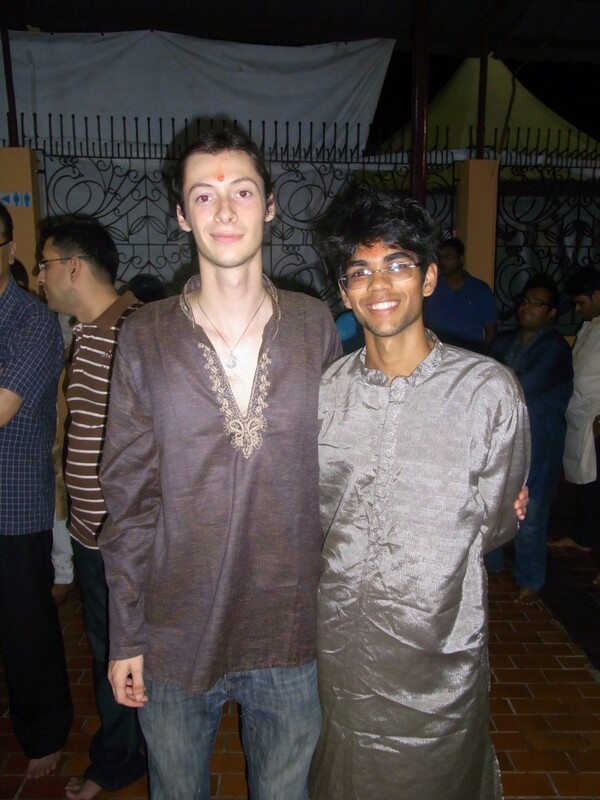 It all started when one of my local Hindu friends told me that there was a big thing going on at one of the temples in KL on Saturday night and told me that there will be lots of music, dancing and vegetarian food. As a vegetarian this was not something I wanted to miss out on and so I took her up on the offer. At the time there was a nine day festival going on, known as Navrathri (Sanskrit for nine nights). The first three days are for Kali amman (the Goddess of strength), followed by three days for Goddess Lakshmi (the Goddess of wealth) and ending with three days for Saraswathi (the Goddess of knowledge). These are the three forms of Goddess Parvati, the wife of Lord Shiva. The final day of the festival is known as Dussehra by the North Indians and Vijayadhasami by the South Indians. On this day a statue of Raavan (the symbol of evil) is burnt to symbolise the idea that evil can be conquered. The day started by getting brunch in Brickfields, KL with my good friend Chandhann. One of our favourite dishes which we often have when we are in this area of KL is an assortment traditional South-Indian dishes on a banana leaf. Essentially it’s a serving of rice, an assortment of vegetables, rasam, dhal, papadam, a sweet and a curry of your choice. If eaten properly with your fingers, it will leave them smelling of curry which you’ll find yourself sniffing for the rest of the day. As we waddled out of the restaurant with our bloated tummies, we attended on the next item on the itinerary for the day. We needed to look decent for the temple that night. Being in a Hindu temple dressed in a shirt and tie is just going to look out of place so what better than to purchase a kurta. With Brickfields being one the predominantly Indian districts of the city I was looking good in my new kurta in no time (You’ll see me wearing this if you scroll further down). After some shopping for various things at a couple of the city’s many vast shopping malls, the two of us began to make our way over to temple. From the station we were given a series of directions from a helpful gentleman who was surprised to hear we were eager to walk the distance instead of taking a taxi. He told us it was only two kilometres but trust me, we walked way more than two kilometres. Eventually we reached the road Jalan Kasipillay but the search was not over yet. We came across a large Hindu temple with music coming from inside, people selling flowers outside and an unusual amount of bustle and activity. We assumed it was the correct temple only to be disappointed: the search was not over yet. We continued on after being told that the temple we needed to be at was down a dead end, only to fall for the same trap again. Again this temple was buzzing with activity and was even down a dead end but no… The search was still on! An hour later after walking the apparent two kilometres we eventually made it to the correct temple. Hooray! After visiting and praying at the temple it was time for the food, and there was lots of it. Thosai, naan, vegetable biryani, nasi goreng, mee goreng, nasi lemak, parathas, pavbhaji, jalebi, pakora, many curries, rice dishes, a whole host of other things and even pani puri were all served. Much of it was VERY spicy and all was vegetarian. After eating we were joined by a couple more friends and then were lead back inside the temple by the music and the thumping of drums. Inside there was an enclosed section in which girls all entered and danced around a statue to a progressive rhythm followed by the guys and so on and so forth. 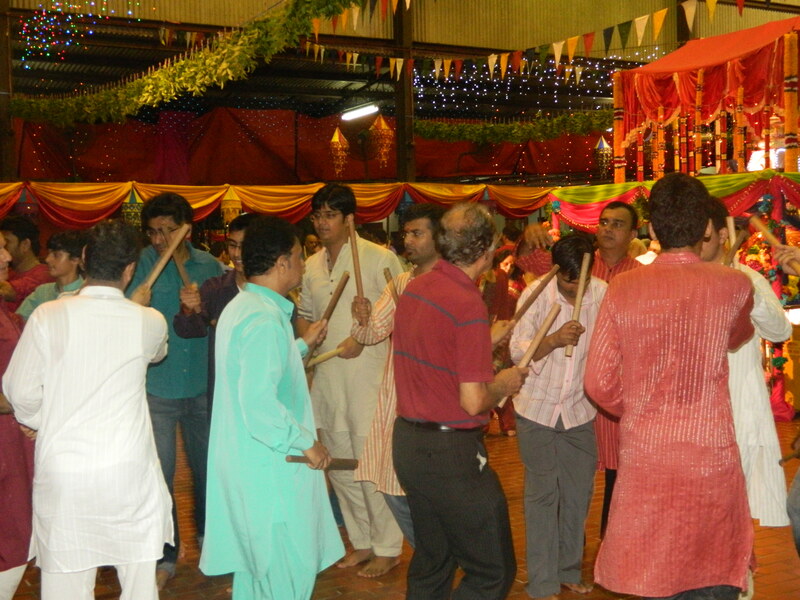 Every other guy’s dance, called the Dandiya, featured two rings of people, one inside the other, each person equipped with a pair of sticks. As the music started the two rings rotated in opposite directions whilst everyone clashed their own sticks together followed by the opposite person’s in an alternating manner moving from one person to the next. This looked like fun so Chandhann and I joined the next round. Exhausted after all the dancing, we rushed back to the station as fast as we could to catch the last train back home. Once we reached the station the counters were all closed for the night leaving us no option but to use the ticket machines. Those of you who’ve used these have probably noticed that for some reason they don’t accept every coin that they’re given. With the time until our train arrives ticking away, we started putting in the coins for the two tickets we need. Fortunately we only needed two since the other two of us had Touch & Go Cards (cards used for tickets for trains and buses which can also be used on the highway toll. It is equivalent to the Oyster card in London). Just when we needed it least, after accepting the first few coins, the machine then decided to reject all the others! We all grabbed our wallets and purses to see if it would take our change. As the coins were being rejected we put them in again, and again and again. We tried everything. We tried putting them in quickly, we tried putting them in slowly. We tried different angles, pinching hold of them in the slot and lowering them as far down as we could before dropping. We even tried kissing them before inserting them in the machine. It sounds odd I know, but strangely that was actually one of the more successful of methods. Every now and then a coin would be accepted and we would all cheer. Progress was slow and time was running out. Just as the train arrived and rumbled throughout the silent midnight station, the final coin was accepted and the last card was dispensed! We grabbed our rejected coins, ran for the platform, down the escalator (which, unsurprisingly considering our luck that day, wasn’t working) and onto the train. The moral of the story is to invest in a Touch & Go Card people! RM10 is a more than worthwhile investment. You can skip the queues for the ticket booths and you never know when a few minutes would be so precious to you. Just when my day couldn’t get any weirder, on the train home, I managed to superglue my lips together. Accidentally of course, but c’mon? How can anyone manage to do this to themself? Hey there are minor errors in the article, hope you don’t mind me pointing them out. First three days are for Durgai / Durga and for courage. The appropriate word is courage. Kali amman is like Durga but the village Goddess (who protects the village of course) for south Indians and Sri Lankan Tamils. Some more info for you and the readers, if you are interested to know more about South Indian Navarathri. Shakthi (Lord Siva’s wife. Shakthi means power. Symbolically woman powers the man and universe 😛 ) killed Mahidasuran / Mahishasuran after a 8 or 9 day war. Devas worshiped the weapons used – sign of thanking her for saving from the asuran – giant evil. So people started to worship whatever equipment they use for survival. For instance, Kings used to keep their swords and worship. Likewise, students keep the books (book gives knowledge) in Pooja and worship – a sign of thanking, appreciating more than worshiping and farmers worship their ploughs. Most religious festivals in Hinduism are made to thank God, appreciating what you got. I’m pleased you liked it, I really appreciate it. Thanks for the amendments, I’m still a novice. I don’t know if they served those, there was so much food I didn’t manage to try everything. This was actually a north Indian temple so they may not have had them all.